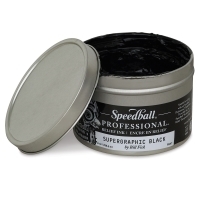 Speedball Professional Relief Inks are artist-quality, oil-based, water-miscible printmaking inks. Containing only the highest-quality pigments in a transparent base, they are ideal for creating crisp, intense prints with archival qualities. Speedball talked to hundreds of printmakers to achieve the working properties professional relief artists desire, such as the ability to hold details, the correct amount of tack, a high degree of blendability, and extreme lightfastness. As a result, Speedball Professional Relief Inks roll out consistently, transfer beautifully, and hold even the finest details. Plus, they clean up easily with water, eliminating the need for harsh solvents. The flagship of the line is Supergraphic Black, created in collaboration with world-renowned relief artist Bill Fick, who says Speedball Professional Relief Inks give him the ability to concentrate on making the image rather than troubleshooting. When printing hundreds of prints, Fick says he has no concerns about the ink drying or clogging up the block, which makes printing "a real joy." 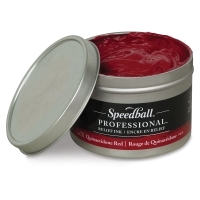 Speedball Professional Relief Inks contain no fillers. See the Item Specs tab for color lightfastness ratings. Set of 4 — Set includes Supergraphic Black, Quinacridone Red, Hansa Yellow Light, and Phthalo Blue. Set of 6 — Set includes Supergraphic Black, Quinacridone Red, Hansa Yellow Light, Phthalo Blue, Titanium White, and Transparent Base.